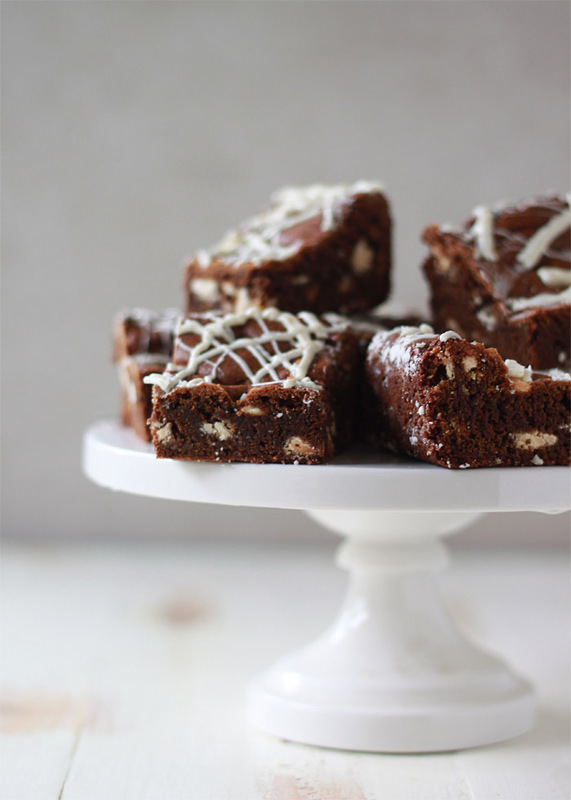 Moist, tender, boldly spiced one-bowl blondies both studded and drizzled with sweet white chocolate. Happy Holidays (or any day) indeed! You know, I think it’s just not right that gingerbread is a holiday-season flavor. It’s too insanely delicious to be relegated to just this time of year. Why don’t we see it in spring? It might just be excellent with rhubarb! Or as a syrup in coffee. Gingerbread iced coffee in June. I know I’d love it, but I’m pretty sure it wouldn’t fly here on the blog. Bah, humbug. Well, I guess I’ll just have to embrace gingerbread right here, right now. And in the form of these dense and moist, chewy and sweet White Chocolate Chip Gingerbread Blondies. 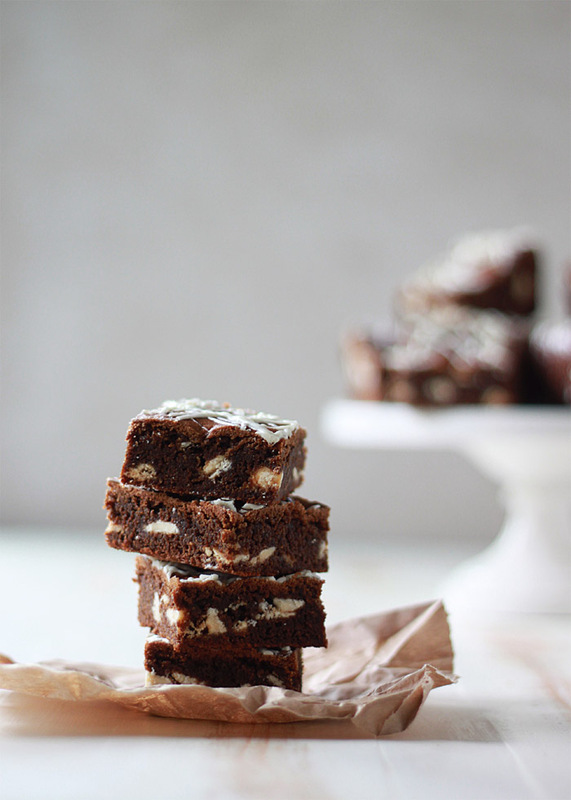 These blondies are so full of gingerbread goodness that they look more like brownies than blondies. But trust me – that’s brown sugar-molasses-spiced-delicious goodness all up in there. With a hefty dose of white chocolate, both drizzled on the top and in chip form in the batter itself. 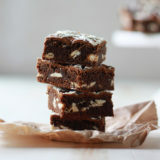 I love the buttery, rich spiced flavor of the blondies, but the white chocolate gives a cool contrast that draws you in bite after bite. Plus, it looks pretty and kind of snowy drizzled over the top. I’m wishing now I’d sprinkled some white nonpariels over the chocolate drizzle for a little extra bit of festivity. If you make these, you should try it! It’ll look like snow. Pretty. When I developed this recipe, I literally just threw this and that into a bowl, spread it into a baking dish, and crossed my fingers. I was shockingly surprised (and admittedly proud) at how well they turned out. The edges do tend to stay a bit high compared to the middles, but I love them that way. More crispy edges without one of those funky maze-shaped brownie pans works for me. These also freeze so well that I could make several batches and keep them in the freezer. And then so I can pull one out whenever I wish. Like on the Fourth of July! Or any other day in the year that’s not the holiday season! Rebel blondies, my friends. Gingerbread 365! Preheat the oven to 350 degrees Fahrenheit. Butter an 8”x8” baking dish or coat with non-stick cooking spray. Add the butter to a large, microwave-safe bowl. Heat at 50% power in 20-second increments until melted. Remove from microwave and whisk in the brown sugar and molasses, then add the egg, ginger, nutmeg, cloves, and salt. Mix well. Sift the flour and baking soda over the wet ingredients. Stir just until combined. Stir in 1 cup white chocolate chips. Pour batter into baking dish. Using an offset spatula or your fingers, press and spread the batter evenly into the pan. The batter will be very stiff. Bake for 30-35 minutes, until dark golden brown, set in the middle, and the edges appear dry. Remove from oven and allow to cool for 60 minutes. They will sink a bit as they cool. Before cutting, drizzle with more white chocolate. Place 1/2 cup white chocolate chips into a microwave-safe bowl. Microwave at 50% power in 15-second increments, stirring after every 15 second zap, just until chips are melted, about 1 minute. 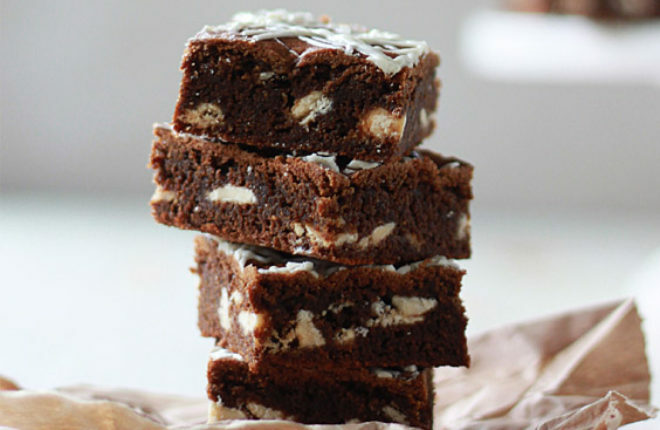 If the chocolate seizes, stir in a 1/2 teaspoon or so of coconut oil or vegetable oil to help loosen it up and get it to a drizzle-able consistency. 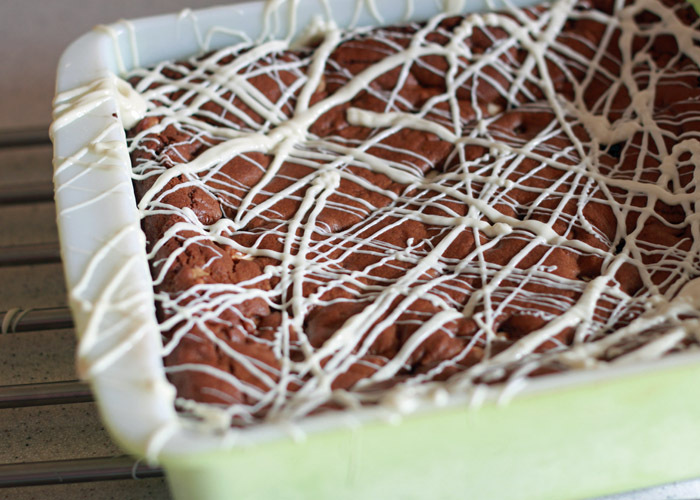 Use a spoon to drizzle the white chocolate over the blondies in the pan. Allow white chocolate to harden, 30 minutes to 1 hour. Blondies keep for several days at room temperature in an airtight container or zipper bag. They freeze amazingly, too! To freeze, cool completely on a wire rack. Place in a single layer in airtight plastic containers or large freezer bag and transfer to the freezer. To thaw, return to room temperature; they should thaw within an hour or two. YES to everything about this post. These would be PERFECT for Christmas time! These are some beautiful blondies. 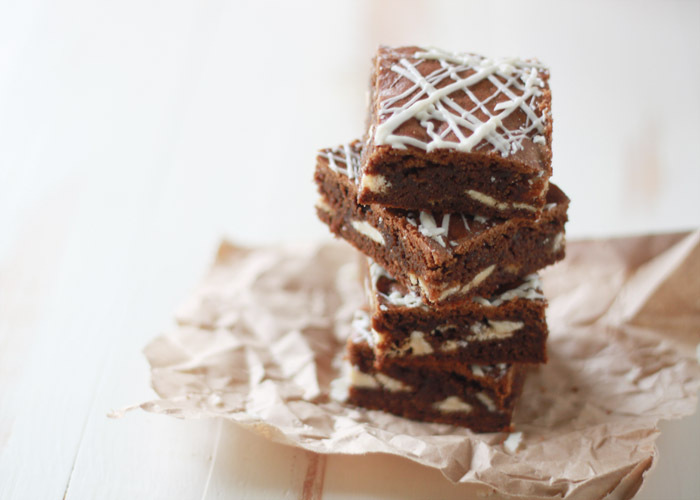 The gingerbread + white chocolate sounds amazing. Your pictures are stunning, and I love your cake stand!! These look so delicious, I can taste and smell them right over the ‘net! Genius of an idea to freeze them. Thanks! These look fabulous, how did you get them so deep and dark? I am always trying to get my gingerbread that color, it looks luscious! I use fresh ginger sliced into rhubarb all the time, you really should try it! These look fabulous. 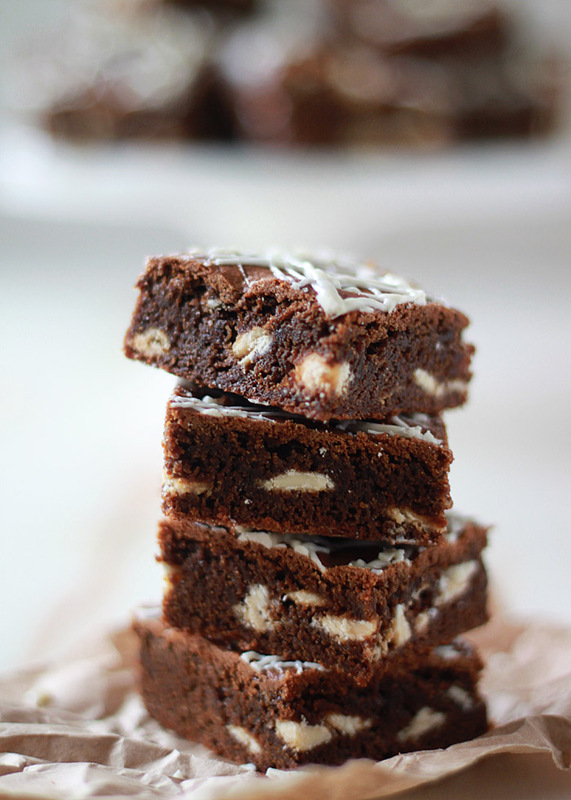 These choc chip gingerbread are some seriously delicious looking stuff. I definitely am craving one to devour right now! Pinned! These are absolutely amazing! Thank you so much for this recipe! They were an instant favorite and becoming a holiday tradition!